So, who had the bright idea to do T25 AND Aerial Silks back to back? This girl. I actually wore my HRM and the 1 hour of Aerial Silk calorie burn is … drumroll… 554 calories. I’m still a super beginner, I sweat a lot and take breaks so I was pretty surprised! That includes stretching 10 minutes in the beginning and 5 or so at the end. I burned 286 doing Alpha Cardio an hour prior to class. I will NOT be doing that again. 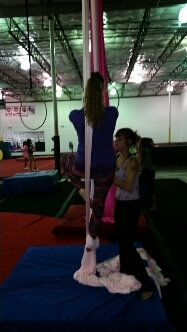 I have to say, my right foot is pretty sore from silks. I have iced it a little today, I hope it is just a bruise. I have erected my Gold Gym Tower, so pull ups/chin ups and dips will be added. I’m going to start on handstand sets too starting on Wednesday after Lower Body Focus T25. This is a really good article on amping up handstand work outs. My other new goal is to be able to do the splits. Crazy right? I haven’t been able to do them since I was probably 8 years old. Being super flexible is important for the silk moves we are learning, and even more so core strength. Fortunately, my core is fairly strong but I’m going keep working.